He's getting an early start. 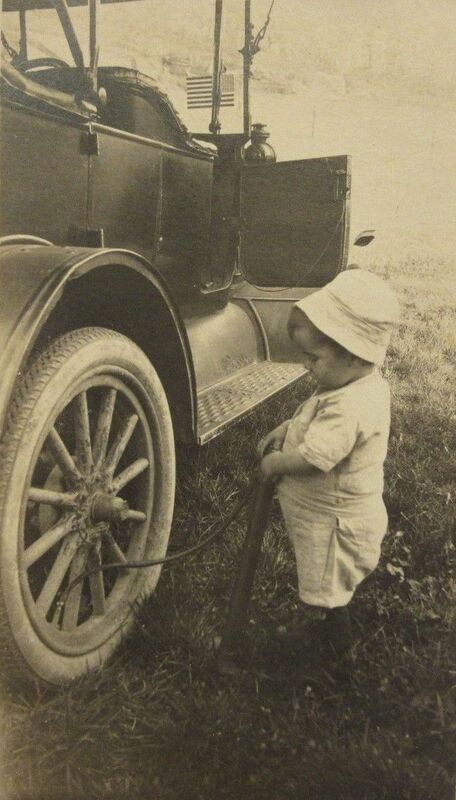 He probably turned out to be a gearhead with dirty hands for the next 80 years. I went to an auction a few months ago and the auctioneer's grandson (about 15 years old) was up on the wagon full of tools holding up items as they were sold off. As he picked up stuff and held it high, the auctioneer would say what it was and describe its general condition before trying to sell it. 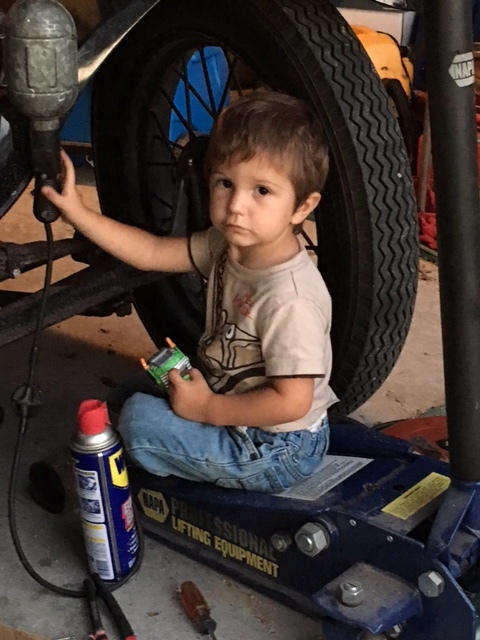 When the kid picked up a tire pump like this one, he put the youngin' on the spot and said, "Hey, Kyle, whatcha got there?" The crowd kept quiet as Kyle looked it over, slowly pulled the handle up and then pushed it down. Next, he carefully examined the hose and fitting before shrugging his shoulders and saying "Some kind of cow milker?" The crowd roared with laughter, but thats how the auctioneer sold it- as " a rare Kyle's cow milker", but it only brought 3.oo. 15 years old and had never used (or seen) a tire pump! By that age I had probably used those contraptions to move enough air to pump up the GoodYear blimp! Here's my little helper. Boy does he love the T.
Hope he has the grease bug for the next 80 years. Steve, that photo needs to be framed, absolutely PRECIOUS !!! My 3 y.o. 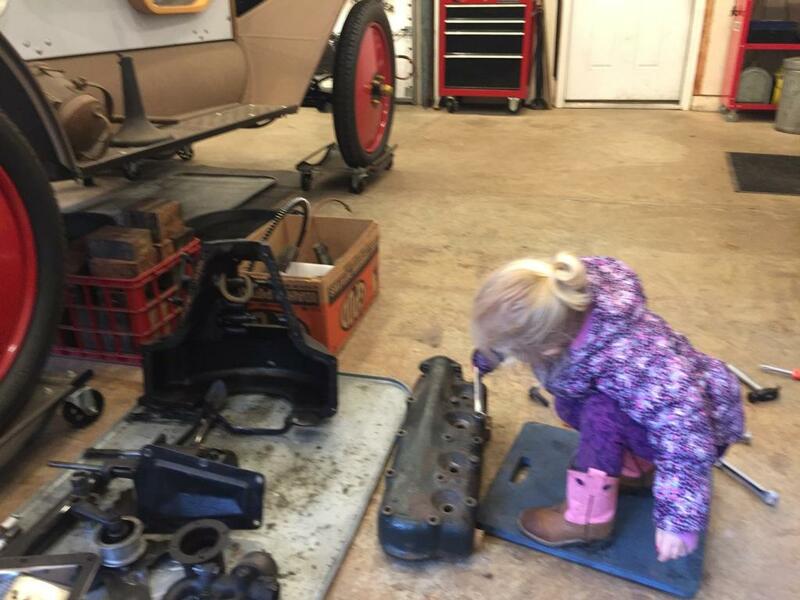 granddaughter helping clean head bolt holes. Another "Precious Photo" Steve, they cannot be staged for a photo shoot like that. Frame it you'll never regret it. My two girls at that age use to spend hours with me out in the shop and still remember those special times, they're 46 & 50 now !!! Wished I would have take pictures of them back then. Darn you Gary!! Took the words right outa my computer keyboard!! Tim, I sent you a PM. Sometimes daddy prefers this little helper! She seems to be good with tools. If She drove the Snap-On truck they would sell out every day. Cant have too many tools. I agree that kids a dead ringer for Spanky. When he's not pumping up tires, he also enjoys doing this.